Nothing like a bit of luck if you are a historian! Posted in Caspar Lumber Company. 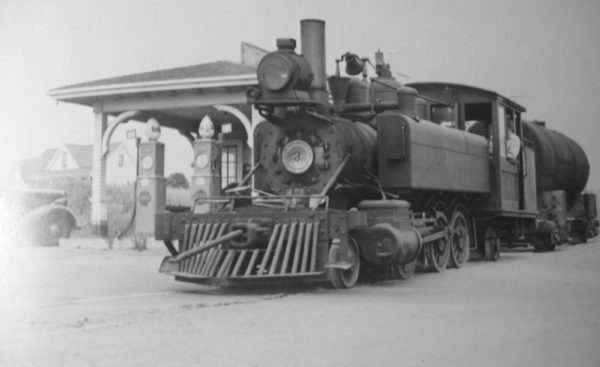 My reply: if you go to this page in our website I think you will find this loco in one the top three photos. So, I think this photo is of a Shay although I can’t tell if it is #2, #3 or #5. Toward the bottom of this web page you’ll see what we know about the Elk/Greenwood Shays. GRCO I am reasonably sure is short for Greenwood Railroad Company. This one took a bit of finding. 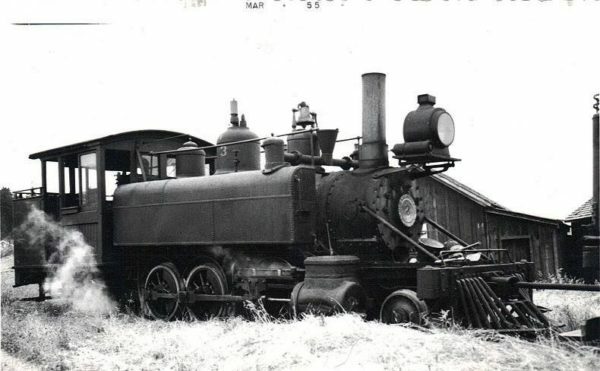 I finally located it on our website in Issues 315-316 of the Western Railroader magazine – Caspar Lumber Company. If you click here you can bring up the entire book . Page though to page 12 and you’ll see this loco in the top photo. Whew that took a bit Shelock Holmesing!!!! 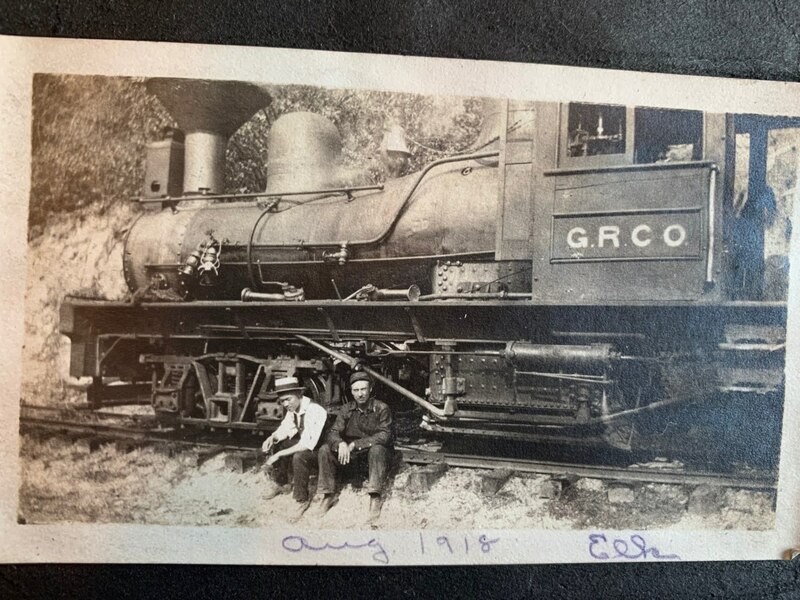 Posted in Caspar Lumber Company, Locomotives, Towns. 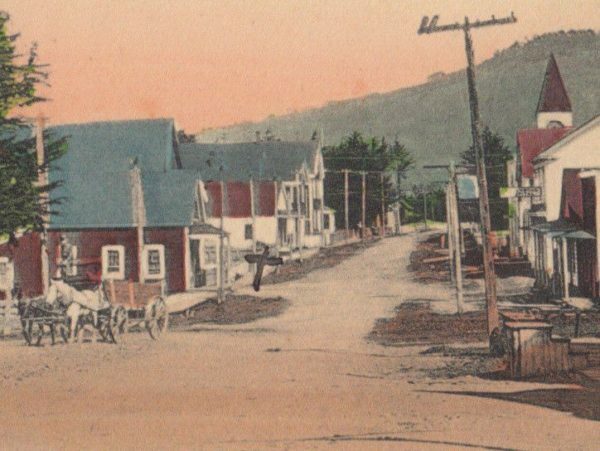 “Just 5 miles south of Ft. Bragg on the California Coast, lies the little town of Caspar. This coastal town today only has a handful of buildings left. 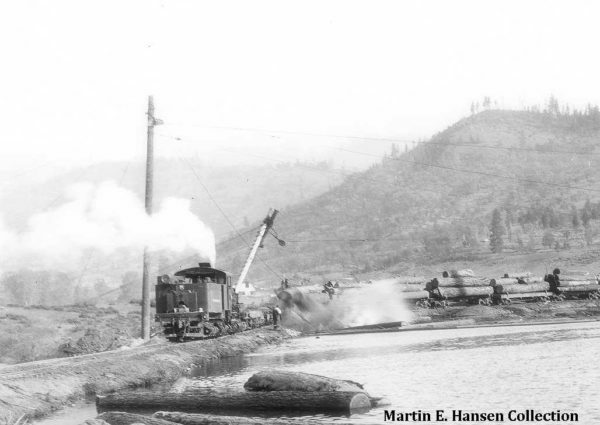 However, in 1870 the town boasted a large sawmill and the beginnings of a logging railroad that never connected to any other rail line. 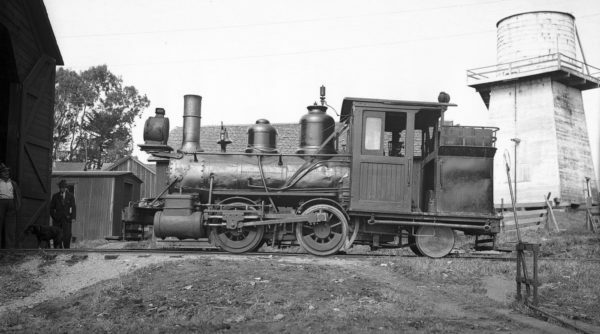 Originally the railroad was animal powered and built on wooden rails. 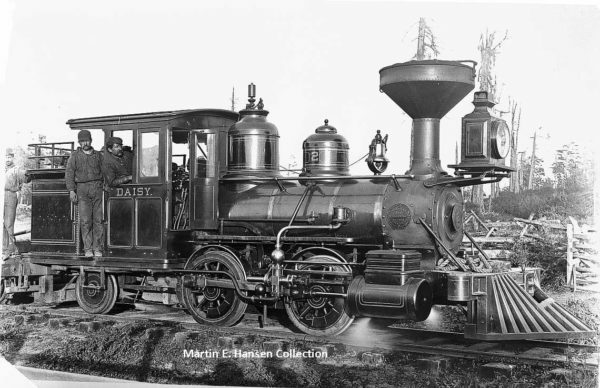 By 1875 steel rails replaced the wooden rails and a small second-hand 0-4-4T built in San Francisco in 1869 was added as the first steam power. 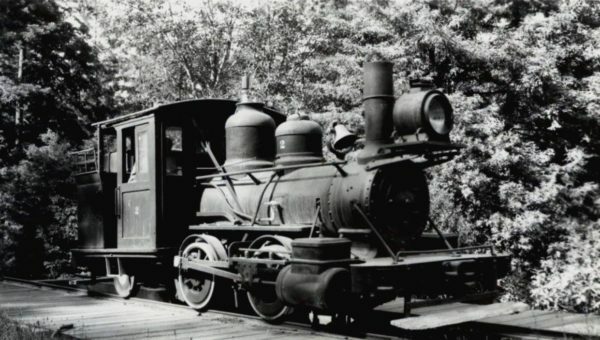 The railroad by this time was known as the Caspar South Fork & Eastern RR. By 1885 the mill was prospering and the railroad had been extended some 5 miles from the mill to the cutting areas. This prompted the Caspar Lumber Company to call on Baldwin to build a new locomotive for the young railroad. 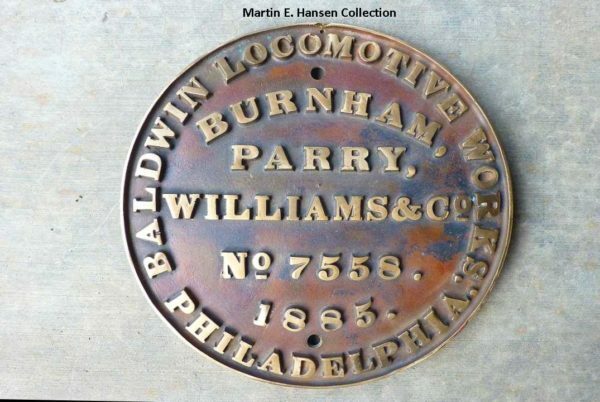 Here is what they got.In June 1885 Baldwin shipped C/N 7558 to San Francisco where it was knocked down and loaded onto the schooner “ABBIE” for the trip up the coast to Caspar. 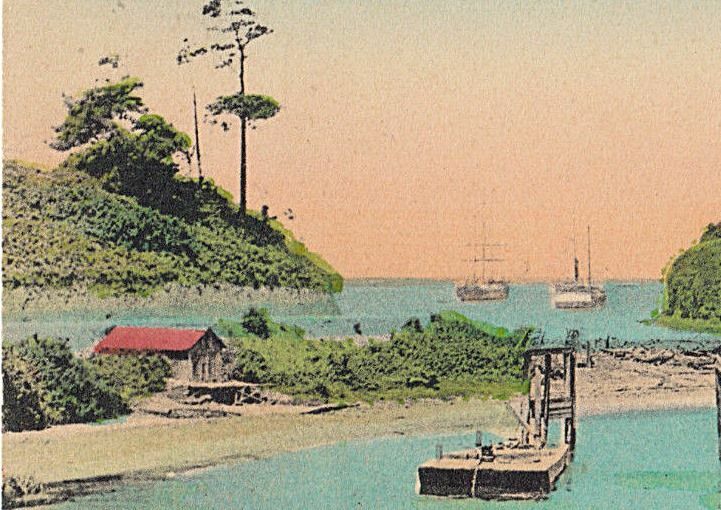 Once in the harbor, she was unloaded and barged to the dock where she was then hauled up the hill to the small enginehouse for re-assembly. The engine was name Daisy when ordered from Baldwin and that name lasted her entire career. In the first photo we see Daisy when she was still new and in her factory paint. You can see the pride her crews took in her in this portrait. 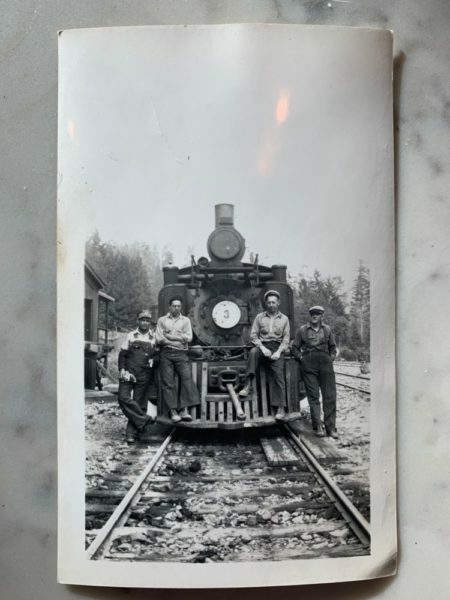 Daisy served very well for decades on the CSF&E and was still in service in April 1938 when she was spotted for pictures during the only railfan excursion held on the CSF&E as shown in the second photo. She is on display in the Museum Deli opposite the Skunk Train Depot. We know from a movie the club has that most of the Caspar Lumber Company’s milled products were shipped to Pittsburg (a town on the southern shore of the Suisun Bay in the East Bay region of the San Francisco Bay Area.) There the Caspar Lumber Company had a controlling interest in a box making factory. Boxes ranged from crates to cigar boxes and everything in between. There was a great need for crates to ship, among other things, fruit from the Central Valley all over the USA. What we/I do not know is whether one of the “partners” was the Fruit Growers Supply Company. “When a large group of Southern California fruit growers banded together in 1907 to form a cooperative association to guaranty they would have a steady supply of wood to make box shook for their packaging, they formed the Fruit Growers Supply Company. This organization marketed their products under the Sunkist Brand name, familiar to most of us. One of their main missions was to accumulate enough timber land to provide a steady and economical supply of box shook. They acquired many large timber holdings until ultimately they became the largest private owner of timber land in California. 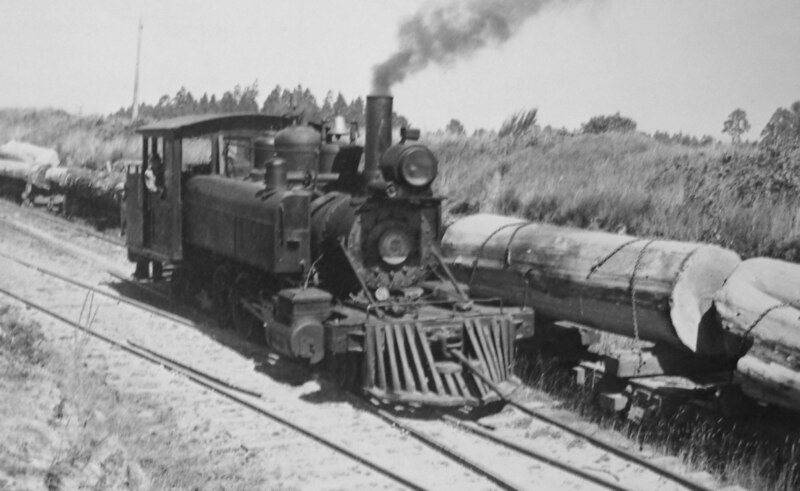 One of their timber holdings was in Northern California near the Oregon border where they formed the town of Hilt. 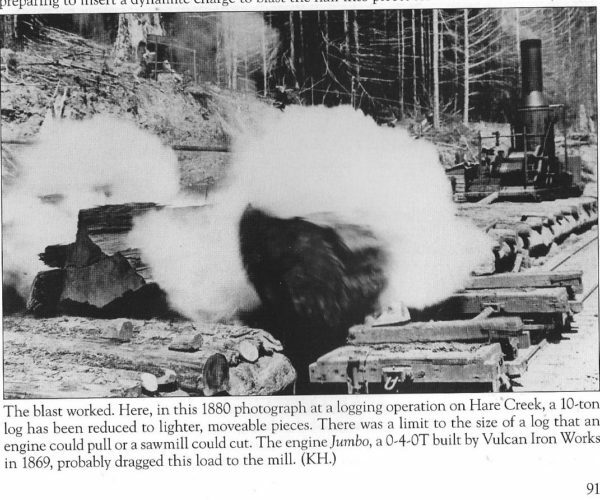 It was at Hilt that they operated a mill and logging railroad system to supply the wood for the company. 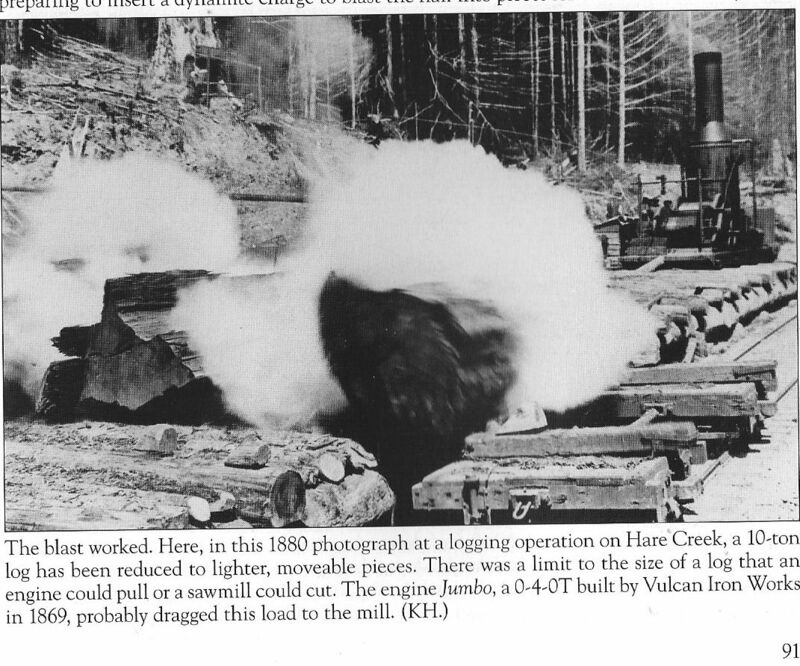 In the late 1930’s famed logging photographer Clark Kinsey traveled to Hilt to photograph the operation for the company. Here we see FGS #5, a big Lima 3-truck Shay as she unloads her log loads at the mill pond in Hilt. This ritual would be repeated day in and day out for many decades until the logging railroad was finally abandoned in the early 1950’s. ” The Sanborn Map Company was a publisher of detailed maps of U.S. cities and towns in the 19th and 20th centuries. The maps were originally created to allow fire insurance companies to assess their total liability in urbanized areas of the United States. Since they contain detailed information about properties and individual buildings in approximately 12,000 U.S. cities and towns, Sanborn maps are invaluable for documenting changes in the built environment of American cities over many decades. Sanborn held a monopoly over fire insurance maps for the majority of the 20th century, but the business declined as US insurance companies stopped using maps for underwriting in the 1960s. The last Sanborn fire maps were published on microfilm in 1977, but old Sanborn maps remain useful for historical research into urban geography. The Sanborn maps themselves are large-scale lithographed street plans at a scale of 50 feet to one inch (1:600) on 21 by 25 inches (53 by 64 cm) sheets of paper. The maps were published in volumes, bound and then updated until the subsequent volume was produced. Larger cities would be covered by multiple volumes of maps. Between editions of published volumes, map updates were sent out as correction slips. Sanborn employees, called “pasters” or “correctors”, would visit subscribers’ offices to paste the slips on top of the old maps.The map volumes contain an enormous amount of information. They are organized as follows: a decorative title page; an index of streets and addresses; a ‘specials’ index with the names of churches, schools, businesses etc. ; and a master index indicating the entirety of the mapped area and the sheet numbers for each large-scale map (usually depicting four to six blocks); and general information such as population, economy and prevailing wind direction. There was another Sanborn Map of Caspar published in November 1909 but, alas, it is not in the Library of Congress yet. Using the +/- up/down and side to side keys you can zoom in on the totally amazing detail encapsulated in the map. 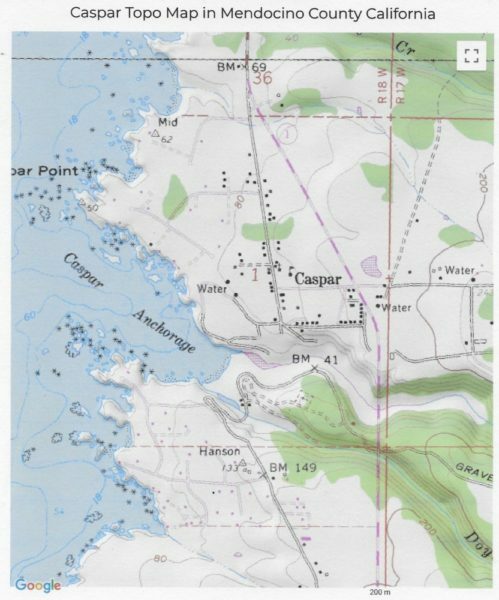 This Topo map shows Caspar today [click on map to enlarge]. Anyone who can correct my info PLEASE contact me. Posted in Caspar Lumber Company, Maps. Click on the photo to see it more clearly. She’s still “alive” and you can find her in the Deli restaurent in Fort Bragg, Ca. 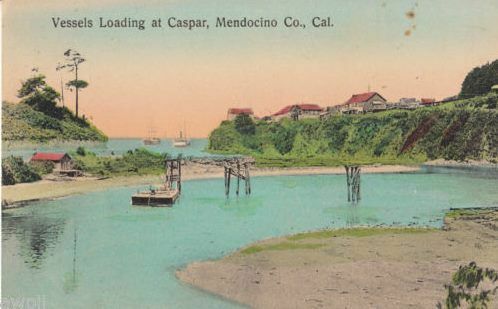 Posted in Caspar Lumber Company, Mendocino Coast, CA , Local History.